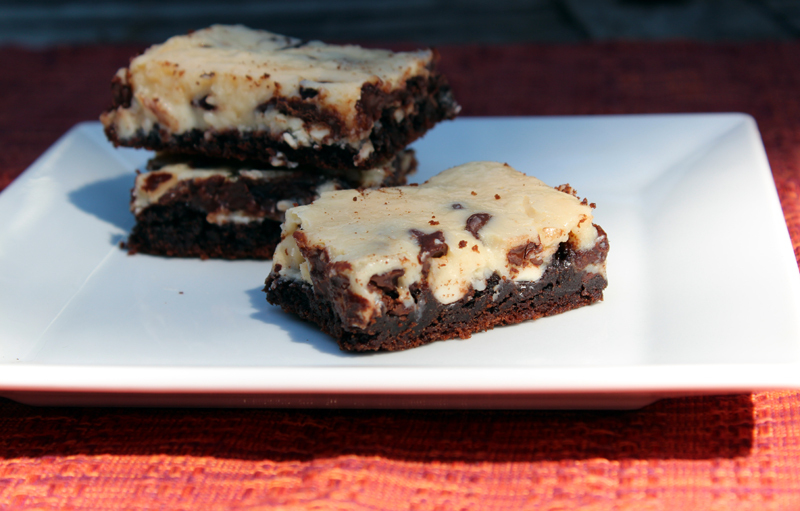 Happiness Project Recipe #10: White & Dark Chocolate Cake Brownies! Oh. My. Word. You don’t know the meaning of true decadence unless you’ve tried this oozing concoction of cake brownie heaven! Considering how much of a chocolate connoisseur I am, I’ve rarely come across a dessert that is simply TOO much for me to handle. Until now. This recipe nearly sugar-shocked me into complete chocolate withdrawal. That’s how good it is! Plus, once the flavors have settled in a bit, it tastes even BETTER the day after (I think so, at least). So here it is, in all of it’s sticky, gooey greatness! Preheat your oven to 350F and prepare a 9×9 pan by lining it with aluminum foil and then spraying it with cooking spray. In a large mixing bowl, combine the cake mix, butter, egg & vanilla and mix with electric beaters. The batter will be very thick & difficult to combine at first, so adding the coffee will help create a softer consistency. Start pressing the dough into the prepared pan & prepare yourself for incredibly messy fingers. Even though it will be a bit sticky, keep pressing & spreading it until it’s evenly laid out. Once you’re happy with the cake layer, sprinkle the white and dark chocolate chips over the top (fun, fun!). In another mixing bowl, combine the sweetened condensed milk, cream cheese & ½ teaspoon of vanilla extract, stir until well combined and pour milky mixture evenly over the cake dough. Bake for roughly 24 to 26 minutes, or until the edges begin to brown and pull away from the sides of the pan. Remember, you can always use a small pairing or serrated knife to cut off the browned edges. The middle will still be quite soft & jiggly upon removing from the oven but never fear, this will continue to set up more after they are cooled. Cool completely on a rack for about 30 to 45 minutes before carefully slicing them up into bars. If not serving immediately, store refrigerated in an airtight container for up to 5 days. So what say you? Think you’ll be able to handle the craziness of this glorious lip smacking concoction? You might want to have a tall glass of milk handy when you do! *hint hint* Good luck! « Happiness Project Recipe #7: Sprinkle Cake Batter Truffles!